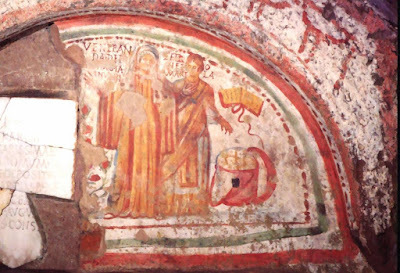 This basilica, built into the above-mentioned Catacomb of Domitilla, has been discovered, and the memorials found in it removed all doubt that the tombs of the three Saints were once venerated there. A painting in which Petronilla is represented as receiving a deceased person named Veneranda into heaven, was discovered by De Rossi in the early 1870's, on the closing stone of a tomb in an underground crypt behind the apse of the basilica. 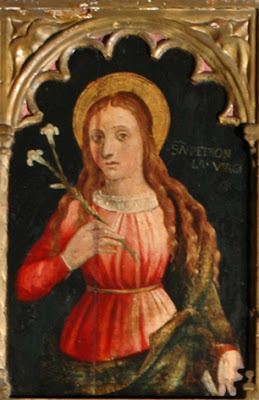 Beside the Saint's picture is her name: Petronilla Mart(yr). That the painting was done shortly after 356, is proved by an inscription found in the tomb. It is thus clearly established that Petronilla was venerated at Rome as a martyr in the fourth century, and the testimony must be accepted as certainly historical, notwithstanding the later legend which recognizes her only as a virgin. Another known, but unfortunately no longer extant, memorial was the marble sarcophagus which contained her remains, under Pope Paul I translated to Saint Peter's Basilica. In the account of this in the Liber Pontificalis the inscription carved on the sarcophagus is given thus: Aureae Petronillae Filiae Dulcissimae ("of the golden Petronilla, the sweetest maiden"). The sarcophagus was discovered, in the very chapel dedicated to her in Old Saint Peter's, under Pope Sixtus IV, who hastened to inform Louis XI of France. We learn, however, from extant sixteenth century notices concerning this sacrophagus that the first word was Aur(eliae), so that the martyr's name was Aurelia Petronilla. The second name comes from Petro or Petronius, and, as the name of the great-grandfather of the Christian consul, Titus Flavius Clemens, was Titus Flavius Petro, it is very possible that Petronilla was a relative of the Christian Flavii, who were descended from the senatorial family of the Aurelii. This theory would also explain why Petronilla was buried in the Catacomb of the Flavian Domitilla. Like the latter, Petronilla may have suffered during the persecution of Domitian in the late third or early fourth century. The absence of her name from the fourth century Roman calendar of feasts suggests that Petronilla died at the end of the first or during the second century, since no special feasts for martyrs were celebrated during this period. After the erection of the basilica over her remains and those of Saints Nereus and Achilleus in the fourth century, her veneration extended widely and her name was therefore admitted later into the martyrology.